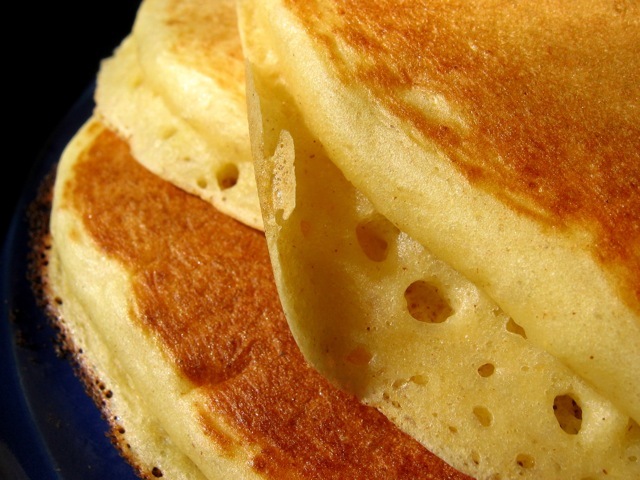 This is a fabulous basic buttermilk-pancake recipe, adapted from a recipe in the Farmhouse Cookbook by Susan Herrmann Loomis. I like to mix together the dry ingredients the night before when I know the morning will be busy. Serve hot with butter and maple syrup. Whisk together dry ingredients in a medium bowl. In a small bowl or 4-cup liquid measuring cup, combine buttermilk, eggs, and oil. Pour the buttermilk mixture into the dry ingredients and whisk just to combine. Heat an electric griddle to 375 degrees or a nonstick skillet over medium heat. When griddle or pan is hot, pour on ⅓ cup batter for each pancake. If using blueberries, sprinkle each pancake with 1 heaping Tbsp. of berries. Cook until bubbles form on the top of each pancake, about 3 minutes. Then turn and cook for about 1 minute minute more. Serve immediately. Culinate editor's note: For extra flavor, add a dash of ground cinnamon and a bit of freshly grated nutmeg to the dry ingredients. Add a bit of vanilla extract (1/2 tsp.) to the wet ingredients. Fresh lemon zest is also nice.